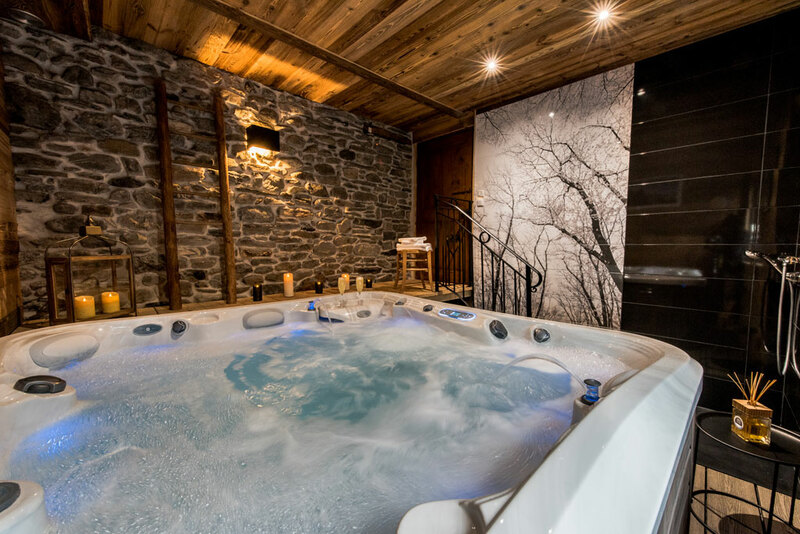 Give yourself a moment of pure relaxation in the spa of the guest room « La Belle Joséphine ». After a day of skiing, physical activity or simply for fun you can enjoy the therapeutic spa in total privacy. The pleasure of jacuzzi baths happens through the pleasure of the senses and entertainment. That’s why we haven’t forgotten chromotherapy and aromatherapy. Knowing this feeling of well-being through all these functions is an absolute privilege. Illuminate the night of a constellation… thanks to the embellishment Constellation, you will have your head in the stars. LED light points surround the spa under the water line and illuminate the outside. You can program the color or cycle you prefer for your lighting with different colors and sequences. Pleasure and relaxation will be there: pleasure of the eyes, scents and sensations.